Travel with Kevin and Ruth! : Water, water, everywhere! I read a statistic the other day that says the average person in North America uses 100 gallons (378 litres) of water per day! They don't say how they arrive at that figure, but it must include everything from laundry to showers to flushing the toilet to watering your front lawn if you have one. Then I think about how we are able to last a week or more in the motorhome on 38 gallons for the two of us when we're boondocking! I know we certainly use way more than 38 gallons a week when we're living a "normal" lifestyle at the mobile home we live in here at the campground, but there's no way it's 200 gallons a day! However, there is certainly no shortage of water here. It poured buckets the last 36 hours! This is the first stretch of really bad weather we've had since we arrived here May 1st. Sure, we've had the odd thunderstorm go through, but we haven't had days of steady rain. And cold! At least cold for this time of year. They're calling for a high of 14C (58F) today! And 80% chance of more rain. I don't mind the cooler temperatures but it's hard to get much done in the rain. Good thing I've got a nice big shop. I'll go up there and putter around today. Ruth baked some chocolate chip cookies though. They sure smell good baking on a rainy day. So because of the weather, the campground is pretty quiet! You'd think it would be totally empty, but that's not the case. In fact, we even had one guy arrive in the pouring rain...said his kids wanted to go camping, rain or shine. Sometimes I have a hard time finding you an Amazon deal that's really a deal, however today I have a couple for you! A three pack of motion sensing nightlights. Regular $27.16, I'm guessing they go on sale for $17.99...let's see. (Edit...they ended up being on sale for only $11.99). Don't forget you'll need to buy 12 AA batteries as well! I agree with you about water usage, when dry camping we use 70 US gallons of water every 10 days the two of us. And about 60 gallons a week when in a campground. Yep, that would be about what our usage is in the motorhome when we are boondocking/dry camping. I admit that we do use more here but we are still careful about our usage and we try not to waste it. Woohoo, I got the drone for $39.99! That is, if it still works by the time you arrive! The $11.50 set of 3 night lights would have made another great stocking stuffer for RV friends---perfect for the bathroom at night. It would if they would only stop letting the water out at the other end! We would hope so too but I bet it isn't! Using your tip, we just saved a good chunk of change by using Google Flight Search for tickets from Boston to Honolulu this fall. Maybe next time we won't be in such a gosh-awful hurry and can fare-watch longer, but we're happy for that much. Love your blog, LOVE the pictures-would love to hitch-hike along with you. Nice! We love it when people get good value for their travel dollar...sounds like a great trip! 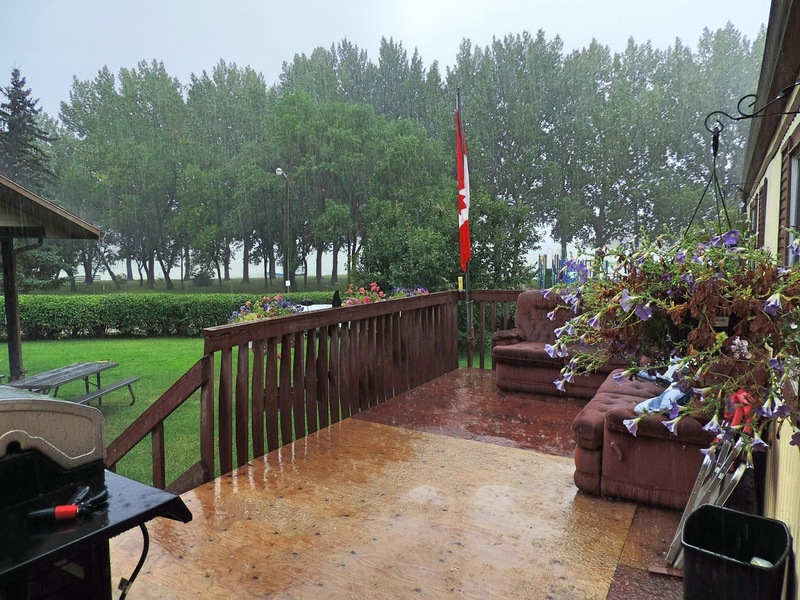 I love your deck, but how did you furniture handle that rain? We have had so much rain in Ohio lately. We received 5" just in eight hours. We have a well and know we use a ton of water. But as RVers, we find that we tend to continue the navy showers from our boondocking days for a least a week after we get back to our "stick and brick" home. Guess old habits die hard. Wow, that's a lot of rain in a short time and we thought we had lots! A hunter, I am not. Travel Photo Roulette - We have a winner! Free $100 Amazon Gift card! Well that was a washout! These are some different camping rigs! Have you ever bought footwear online?